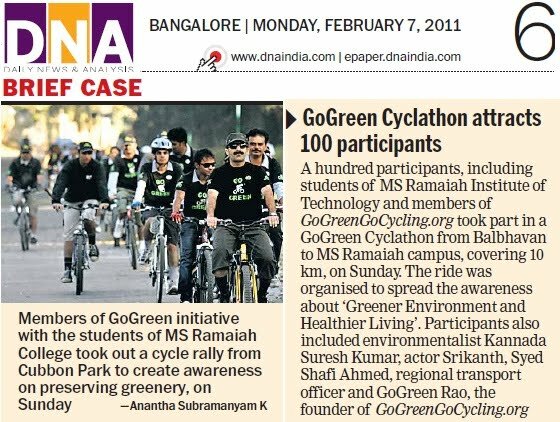 GoGreen Special Campaign Ride along with MSRIT students 06Feb2011 - GGI-Group size: 4000+ Professionals, Increasing on day to day basis, Come & join us 2 serve Mother Nature. 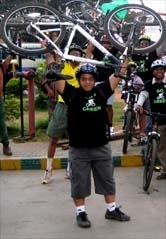 A Special Ride ride along with MS Ramaiah Institute of Technology students was held on 06feb2011. South-GoGreen Group started from RIS junction @ 6:45am and reached Cubbon Park's Bala Bhavan by 7:25am where other GGI's along with students from MSRIT were waiting. Due some mis communications, the students Cycles didn't arrive hence need to wait. We were suppose to start the ride by 7:45am but finely started of @ 9:00am. 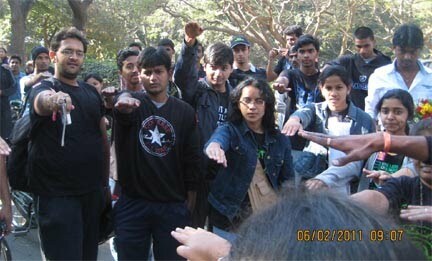 All the participants took a oath of taking care of the mother nature. 39 GGI's were present on today's ride along with 25 more cyclist from MSRIT + 10 to 15 volunteer students. 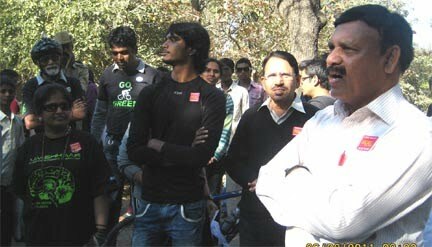 Following were the chief guest for this special Ride.. Following was the route followed . Bangalore Golf course(LS) Road - Hotel Le-Mardian (RS)under bridge of Windsor Maner(RS)- Chowdaiah Road - Sanky Road- Sanky Road Junction - Basham Circle - across Sanky Tank lake - CV Ramanagar Main Road - Sadashivnagar Police Station - New BEL Road - MS Ramaiah Unniversity. Campaign Ride in DNA News Paper..
A special Note from EDC's E-Leader Sneha Satish.. This today's Event would not have been possible without the support and encouragement that you and your team provided us with. 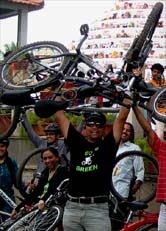 It was a first time for most of our participants and the encouragement, guidance that the members of Go Green Go Cycling gave our participants was the main motivating factor behind the completion of the cyclothon. We truly appreciate the members’ patience, openness and friendliness. 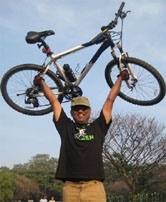 Thank you so much Sir for giving us an insight into Go Green Go Cycling. I can without doubt say that Go Green Go Cycling inspired and made a difference to all the students of MSRIT who participated today. The energy and zest that your members had today was the fuel for our students! I thank you all for being a part of NEN E-Week 2011. Looking forward to many more such collaborations and partnerships!